Kaleidascope Agate is a stone that is fast becoming a sought after addition to many jewelry collections. The appearance of the stone reinforces the name for it truly looks like a kaleidoscope of colors. The name of the stone appears to be misspelled, but this is the name given to it by its discoverer. Note all the colors in this stone…purples, greens, blues, and more. The conglomerate stone is a mixture of Malachite, Chrysocolla, Fluorite prisms. 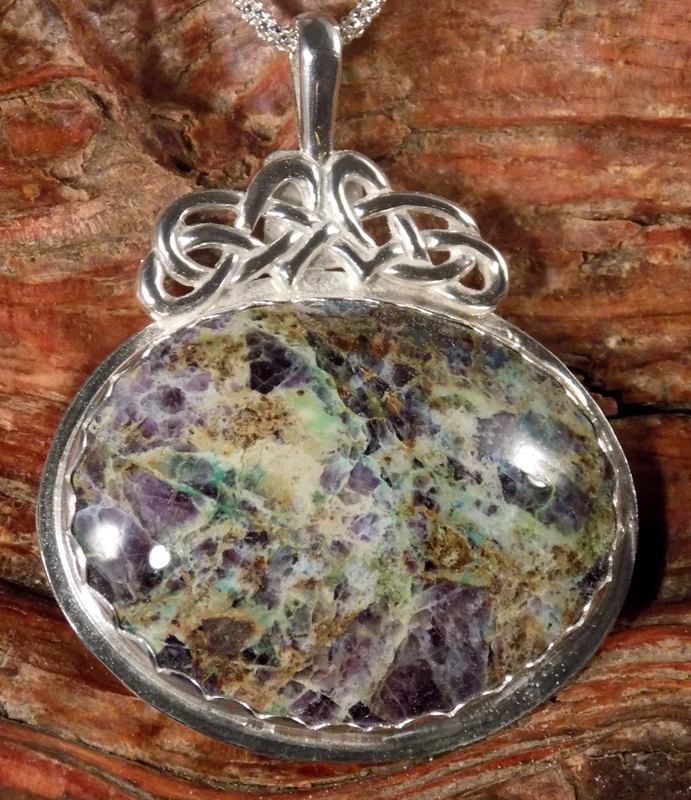 The pendant is topped with a Celtic Knot…Sterling Silver, of course. It is accompanied by an 18″ Sterling Silver popcorn chain. $220.00 including free shipping within the US. This pendant is approximately 2″ tall, including bail.